Why is the internet one of the richest places to seek enlightenment? 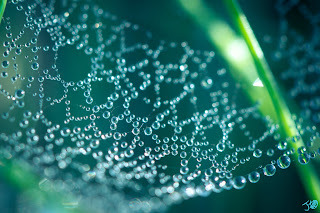 With all of the readers connected by way of this web, I can't think of a better illustration of one of the most basic metaphors for the nature of reality: Indra's Net of Jewels. Oh, and hi there. Welcome to this node, Jewel. “Far away in the heavenly abode of the great god Indra, there is a wonderful net which has been hung by some cunning artificer in such a manner that it stretches out infinitely in all directions. In accordance with the extravagant tastes of deities, the artificer has hung a single glittering jewel in each "eye" of the net, and since the net itself is infinite in dimension, the jewels are infinite in number. There hang the jewels, glittering like stars in the first magnitude, a wonderful sight to behold. If we now arbitrarily select one of these jewels for inspection and look closely at it, we will discover that in its polished surface there are reflected all the other jewels in the net, infinite in number. Not only that, but each of the jewels reflected in this one jewel is also reflecting all the other jewels, so that there is an infinite reflecting process occurring." In addition to email work, I currently guide on one of those free forums named in the link bar above. And right now, I'm noticing a trend. It's one of Inquiry Laziness. It appears that a guided inquiry into whether a separate self exists can make it seem as though the so-called process is just a wee bit too easy. If you recognize yourself in that paragraph above, I don't mean that to insult. But I do mean to shake you up. Ok, I'm going to lay aside all of that nondual or enlightenment speak and put this in plain, everyday language. A guide or teacher will not and cannot give you a shortcut or free pass by convincing you that there is no separate self. The inquiry has to be done in its entirety, and it has to be done, ironically, by this supposed "You". What's more, to do this direct inquiry, you need to be hungry for finding out what's TRUE, not thirsty for what Feels Good. I'm not sure this is news, but looking to have a guide or teacher 'teach you no self' just plain doesn't work. Philosophical debates with the guide, by the way, are absolutely POINTLESS. The reason for this is that debates are of the mind, and the mind's basic function is to create a chasm between understanding and imagination. That chasm IS the illusion of separation. And you've got to know by now that in this inquiry, the mind and its tools are the very last weapons you should be wielding. TRUST your guide not to give you a shortcut, but to figure out how to kick you in just the right place to get you started in finding your own way. Because all they're trying to do is to get YOU to look for yourself. We have no special powers or ability or insight that you don't currently have. Right now. I'm not kidding. None. All we can ever do is to show you how to hold up a mirror and try like hell to get you to notice what's not in it. 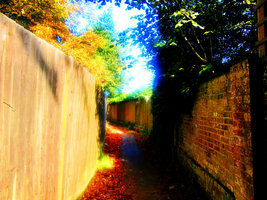 Once you do, the next task is to stop you from turning away from your own absence. If you're working with a guide or teacher who is repeatedly and stubbornly asking you to examine your own direct experience, then you've found something worthwhile. Stick with your direct perceptions, the findings of your senses. And when the 'Yes, BUT' thought comes in to contradict what's been directly experienced, know it's the mind. Take a breath. Don't go for what looks like an easy out by turning to the guide or teacher to remove that doubt for you. You've got to do it all by yourself. Where is the "yeah, but" coming from if not other than thought? Those thoughts are little protests against the truth, born solely of conditioning. Good ole conditioning, the comfortable quilt that snuggles thought into the grooves of memory, is what prompts the 'yeah, buts'. In the face of your findings, They Lie.